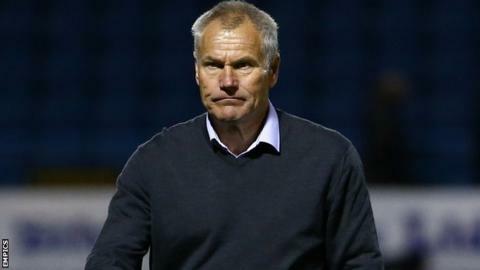 Gillingham manager Peter Taylor says he would understand if he was sacked by chairman Paul Scally, but has pleaded for more time at the League One club. The Gills are in the relegation zone following a run of one win in 12 games. Taylor told BBC Radio Kent: "If the chairman picked up the phone and said 'Peter, that's it, you're not having any longer' I would totally understand. "The majority of the fans probably want me out. What I would like to have here is a lot more time." Gillingham have only won three of their 16 league games this season and are currently two points from safety. Taylor led the club to 17th place in League One last season after taking charge in October, initially as interim manager, and subsequently targeted a mid-table finish this season. The 61-year-old received the backing of Scally last month but accepts that it is hard for supporters to show patience while they are struggling. "I understand the fans' frustrations. We were all expecting a better season than we are having," he said. "We are in a bit of a hole and need to dig ourselves out of it. "Peter Taylor was rightly credited with keeping Gillingham in League One after taking over from Martin Allen in October last year. Over the summer he implemented an overhaul of the squad, bringing in a number of young players. While most fans applauded the idea of freshening up the squad and style of football, a run of just one league win in 12 games has led to many calling for the manager's head." "I really do feel that there is a good squad here but we are not showing it at the moment. I would love longer. "One win in 12 league matches is not good enough. I lost my job at Palace when we had one defeat in five. "If the chairman sacked me I couldn't complain and I wouldn't complain. Me and the chairman wouldn't fall out either. I am not going to walk away. I am desperate to turn it around and I do honestly feel I will do. I am very determined to." Taylor overhauled Gillingham's squad during the summer, making eight permanent signings. He says injuries have played a part in their struggles so far this season, with goalkeeper Stuart Nelson (thumb), utility man Aaron Morris (hamstring), midfielder Doug Loft (Achilles) and striker Danny Kedwell (knee) all missing chunks of the campaign. "If we'd have had no injures whatsoever then I would expect to be gone by now," Taylor, who had a spell as England's caretaker manager in 2000, said. "There are reasons why we have got a lack of form and confidence. "I don't think I've ever been able to put a consistent team out. It doesn't half mess you about when you are a squad of our size in League One. "You need your best players available all the time. Too many times, we have had some important players unavailable and that would affect any team. "I don't want to make excuses but I just want to clear it up with people out there that are unhappy. I am enjoying every second of the job apart from the results. I am determined to improve them."